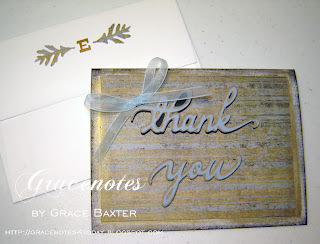 Here is another thank-you card and matching envelope. This thank-you card turned out better than I expected it would. 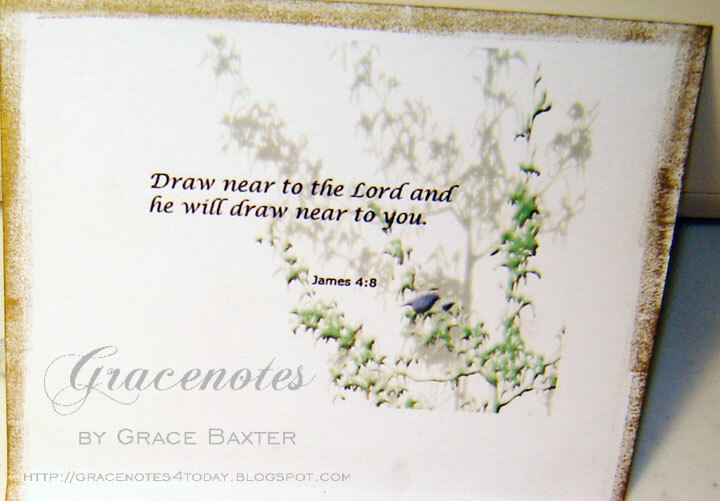 The card base is white, sponged with black ink, then gold. 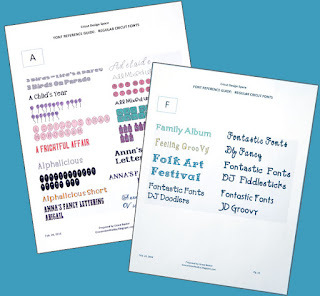 I chose this particular front panel card stock because it works well for men or women. The shade of blue is almost gray, yet works well with my aqua sheer ribbon. On the card front, 'thank you' is not shadowed but backed with black, using the blackout feature. I did this so that when I added the dimensional pops, you can see the black underneath without it actually outlining the words. The inside of the card is where all the work is. In PhotoShop, I created the graphic of the trees, layering the images and making them different shades of green. The leaves of the tree are bevelled and embossed. I was thrilled to discover the 'bird' shape in PhotoShop. I couldn't resist making a larger one and a smaller one for the baby. 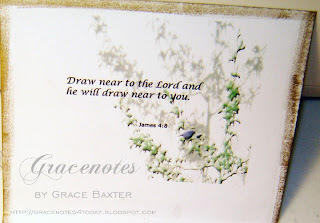 The "Draw near..." Bible verse is the perfect sentiment for this card. I embellished the envelope in keeping with the elegance of the gold card. I created a monogram, using a gold letter from a purchased alphabet set and punched leaves from the same stock as the card. I love how this card turned out. In fact, I like it so much, I can't decide who the lucky recipient should be!